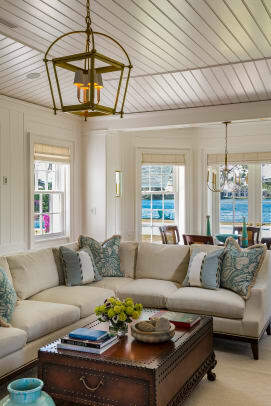 The two-story, 8,150-square-foot Anglo Caribbean-style residence replaces a one-story home built in the 1970s, and is sited diagonally on the angled corner of a street intersection. It consists of a main block and two dependencies, the garage and the guest house, which are attached by breezeways—together they form the entry courtyard featuring plantings and fountains hemming the walk to the portico. 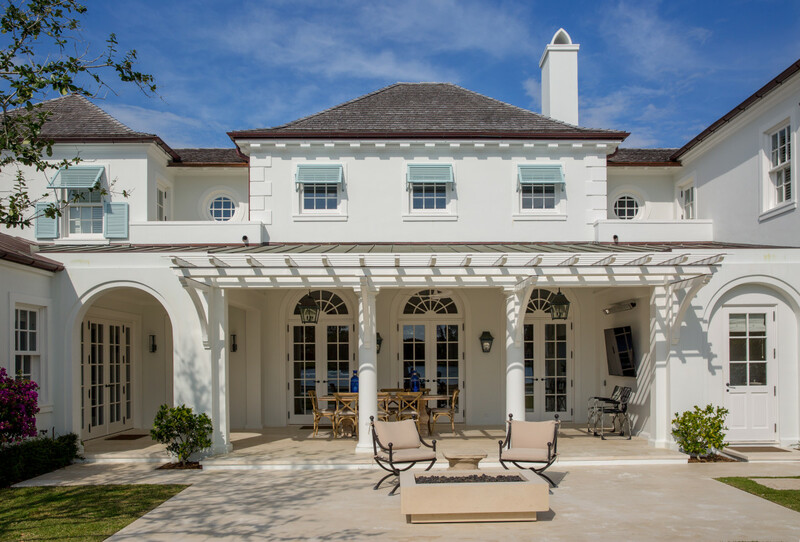 Anglo Caribbean-style residence in Florida. A central octagonal tower on the entry side features prominently, and is connected to two secondary wings by hyphens. The exterior walls are stucco on concrete block; and the cornices on the main block include a combination of run stucco with stone modillions, while the hyphens’ and first-floor dependencies’ outlookers are of painted wood. The Caribbean influence is evident in the steeply sloped roofs, which are a combination of wood shingle and standing seam copper. Also, the windows are dressed in a combination of Bahama and colonial shutters; both the windows and doors are made of impact-resistant painted mahogany. In back, an expanse of lawn with terrace, fire pit, and pool/spa, visually reaches the lake beyond. The library room is a perfect place to relax or study. The interior layout is one that stems from a transverse corridor, originating in the entry hall and terminating at the library in one direction and the dining room in the other. The main axial sequence of spaces moves from the motor court through to the lake at the rear. A secondary axis connects the dining/billiards room to the cypress-paneled library through the entry hall. These two axes are repeated on the second floor—one runs from the rookery to the living room clerestory, where windows yield lake views, while the perpendicular moves from one bedroom wing to another via the balcony on the living room’s second floor. 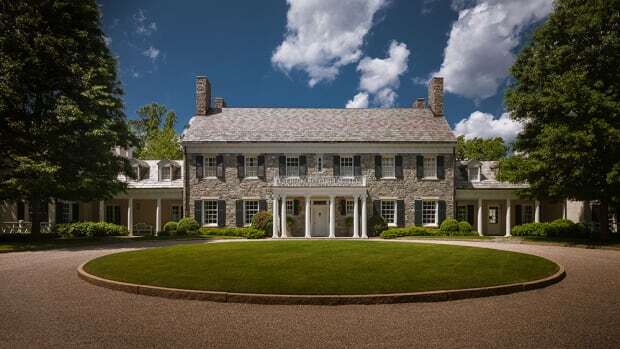 The two-story living room sits opposite the entry, its first-floor French doors opening to a deep veranda shaded by a bracketed arbor atop a Doric colonnade. The simplicity of a modern dine-in kitchen. 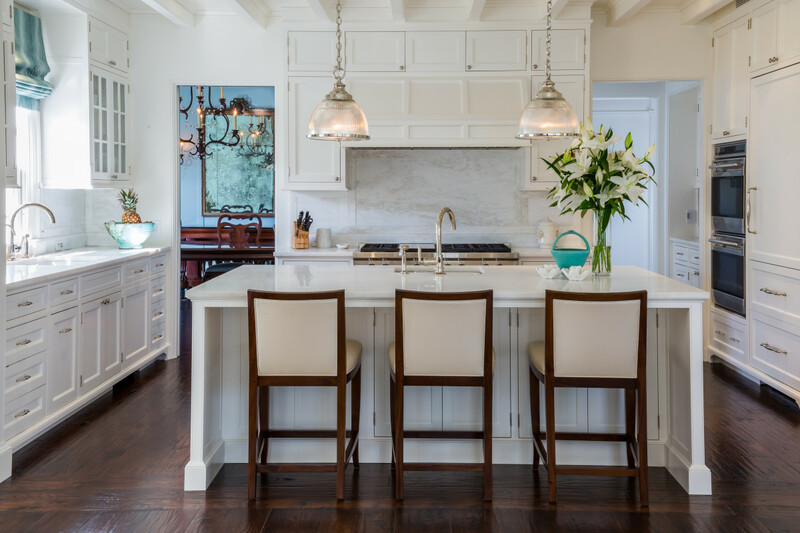 Detailing includes flooring of scraped and stained hardwood and natural stone tiles; painted wood tongue-and-groove tray ceilings; and architect-designed cabinetry and trim executed by local millwork companies. The ways in which formal and relaxed elements are wed, i.e. 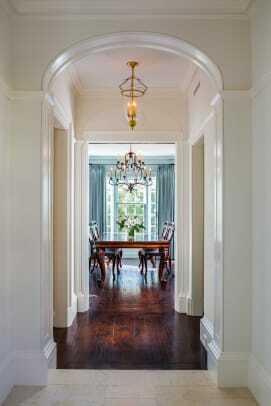 the linking of forms, played a central role in the design’s success. The back porch complete with dining area and fire pit. 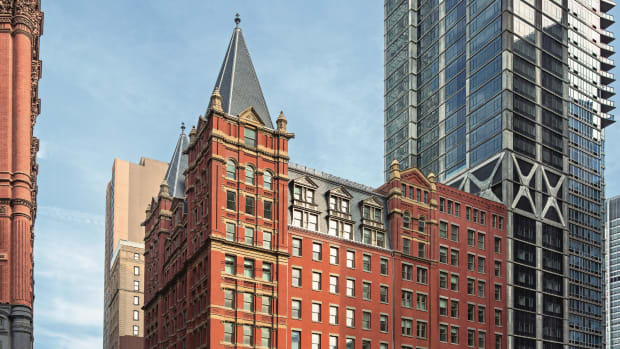 This New York hotel renovation project demonstrates how technological solutions make historic restoration and renovation possible.